Synonyms and Other Names: Tilapia melanopleura Duméril 1861, Zill's tilapia, St. Peter's fish. Tilapia zilli is a common misspelling. Identification: Cichlids can be distinguished from superficially similar sunfishes and black basses (Lepomis and Micropterus; family Centrarchidae) by a single nostril opening on each side of the head (vs. two in centrarchids) and the presence of a discontinuous or two-part lateral line (vs. a continuous lateral line in centrarchids). Redbelly tilapia is included in identification keys given in Moyle (1976) and Hubbs et al. (1991). Distinguishing characteristics were given in Taylor et al. (1986), Page and Burr (1991), and Eccles (1992). Photographs appeared in Taylor et al. (1986), and Axelrod (1993). Identification of this species in the United States has been problematic and some reports in the literature may be misidentifications (Lee et al. 1980 et seq.) or reports of hybrids (Courtenay et al. 1984; Taylor et al. 1986; Howells 1991b). Redbelly tilapia is nearly identical to redbreast tilapia T. rendalli; many reports or specimens of T. zillii may have been T. rendalli. Redbelly tilapia is similar to another North American introduced cichlid, spotted tilapia (T. mariae): spotted tilapia lacks the deep red ventral coloration present in T. zillii, has lateral bars that extend onto the dorsal fin, and 5-6 square black blotches along the side (lacking in T. zillii). Native Range: Tropical and subtropical Africa, and the Near East. West Africa through South Morocco, Sahara, Niger-Benue sytem, rivers Senegal, Sassandra, Bandama, Boubo, Mé, Comoé, Bia, Ogun, and Oshun, Volta system, Chad-Shari system (Teugels and Thys van den Audenaerde 1991), middle Congo River basin in teh Ubangi, Uele, Ituri, and Itimbiri (Democratic Republic of the Congo)(Thys van den Audenaerde 1964), Lake Albert, and Lake Turkana through the Nile into Israel and Jordan Valley (Trewavas 1982). Table 1. States with nonindigenous occurrences, the earliest and latest observations in each state, and the tally and names of HUCs with observations†. Names and dates are hyperlinked to their relevant specimen records. The list of references for all nonindigenous occurrences of Tilapia zillii are found here. Ecology: Redbelly tilapia is primarily herbivorous, with aquatic macrophytes, algae, and diatoms generally comprising >80% of its diet and the remainder including aquatic insects and crustaceans and fish eggs. Proportion of diet from animal sources is generally size-related, with larger fish consuming more animal-based food items (Khallaf and Alne-na-ei 1987). Redbelly tilapia is extremely tolerant of saline conditions, with survival and growth occurring in salinities up to 40‰ and reproduction occurring through 29‰ (Stickney 1986). This species is a substrate spawner, with fishes forming monogamous pairs and exhibiting biparental guarding behavior. Nests are primarily small, saucer-shaped depressions in the substrate, but show some variation in morphology due to environmental conditions (Bruton and Gophen 1992). Breeding season is dependent on climate, with warm, temperature-stable equatorial populations breeding year-round, and those in areas with more defined seasons breeding during summer months (Siddiqui 1979; Bruton and Gophen 1992). Means of Introduction: Introduced in most locations by state agencies, universities, or private companies for control of aquatic plants, to control mosquitoes and chironomid midges, as forage or food fish, and for aquaculture evaluation (Minckley 1973; Legner and Pelsue 1977; Lee et al. 1980 et seq. ; Shapovalov et al. 1981; Grabowski et al. 1984; McGowan 1988; Courtenay and Robins 1989; Page and Burr 1991). For example, the species has been stocked into various North Carolina waters for aquatic plant control by Texas Gulf, Inc., and also by Carolina Power and Light Company (Courtenay et al. 1986; J. Crutchfield, personal communication). There have been both authorized as well as illegal releases. Introductions into Dade County, Florida, probably resulted from escapes from nearby fish farms or aquarium releases (Hogg 1976a, b). Redbelly tilapia and blue tilapia were inadvertently introduced into Hyco Reservoir in North Carolina in 1984 after a small number of fish escaped from a holding cage located in the heated discharge area during an on-site agricultural study (Crutchfield 1995). Agents and reasons for introductions were reviewed by Courtenay et al. (1986). Status: Established or locally established in southern Arizona and California, Hawaii, North and South Carolina, and Texas; reported from several other states. Considered eradicated from all sites in Florida (Smith-Vaniz, personal communication) and Nevada (Courtenay et al. 1984, 1986). In California, Oreochromis mossambicus has largely replaced T. zillii in the Salton Sea (and possibly in coastal southern California) (Swift et al. 1993). Impact of Introduction: The redbelly tilapia is considered a potential competitor with native fish for food and spawning areas, and is potentially detrimental to California rice crops (Pelzman 1973). Juvenile T. zillii were implicated in population declines of desert pupfish Cyprinodon macularius inhabiting shallow irrigation canals near the Salton Sea, California (Lee et al. 1980 et seq. ; Schoenherr 1985). In Florida, this species was found to be highly aggressive; it is considered a serious threat to native aquatic plants and to fish that rely on plants for cover, foraging, or spawning sites (Courtenay et al. 1974). In Hyco Reservoir, North Carolina, feeding by introduced redbelly tilapia eliminated all aquatic macrophytes from the reservoir within a 2-year period that coincided with declines in populations of several native fishes; tilapia populations continued expanding in the absence of macrophytes because of its ability to switch to alternate food sources (Crutchfield et al. 1992; Crutchfield 1995). Remarks: Populations introduced into Alabama normally did not survive the winter and required annual restocking (Smith-Vaniz 1968). However, their tolerance to cold temperatures in central California prompted officials to place the species on the prohibited list for portions of the state (Shapovalov et al. 1981). 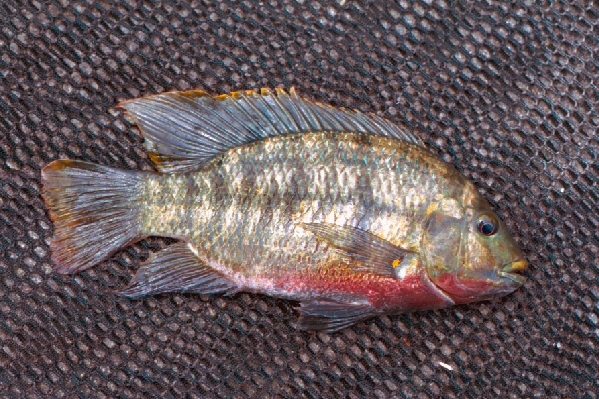 A portion of the population found in a borrow pit in Perrine, Dade County, Florida, included hybrids with Tilapia mariae (Taylor et al. 1986; UF 39875). For detailed information on introduction history see Courtenay and Hensley (1979b), Shapovalov et al. (1981), Grabowski et al. (1984), and Courtenay et al. (1986). In addition to the U.S., redbelly tilapia has been introduced to a variety of places worldwide (Welcomme 1988). Voucher specimens: Arizona (UF 175058); California (UF 175423-4); Florida (UF 39874, 92219, 175422); Guam (UF 182033); Idaho (CAS 225007); Nevada (UF 91904, 175055); North Carolina (UF 92221;, NCSM 15850, 46047, 47055, 47797, 10033; UNCC uncatalogued); Texas (TNHC 27432, 45609). Axelrod, H.R. 1993. The most complete colored lexicon of cichlids. Tropical Fish Hobbyists Publications, Inc, Neptune City, NJ. Bruton, M.N., and M. Gophen. 1992. The effect of environmental factors on the nesting and courtship behaviour of Tilapia zillii in Lake Kinneret (Israel). Hydrobiologia 239:171-178. Courtenay, W.R. and J.E. Deacon. 1982. Status of introduced fishes in certain spring systems in southern Nevada. Great Basin Naturalist 42(3):361-366. Courtenay, W.R. and D.A. Hensley. 1979a. Survey of introduced non-native fishes. Phase I. Introduced exotic fishes in North America: Status 1979. Report submitted to National Fisheries Research Laboratory, US Fish and Wildlife Service, Gainesville. Courtenay, W.R., Jr. and D.A. Hensley. 1979b. Range expansion in southern Florida of the introduced spotted tilapia, with comments on its environmental impress. Environmental Conservation 6(1):149-151. Courtenay, W.R., Jr., D.A. Hensley, J.N. Taylor, and J.A. McCann. 1984. Distribution of exotic fishes in the continental United States. 41-77 in W.R. Courtenay, Jr., and J.R. Stauffer, Jr., eds. Distribution, biology and management of exotic fishes. John Hopkins University Press Baltimore, MD. Courtenay, W.R., Jr., D.A. Hensley, J.N. Taylor, and J.A. McCann. 1986. Distribution of exotic fishes in North America. 675-698 in C.H. Hocutt and E.O. Wiley, eds. The zoogeography of North American freshwater fishes. John Wiley and Sons, New York. Courtenay, W.R., Jr., D.P. Jennings, and J.D. Williams. 1991. Appendix 2: exotic fishes. 97-107 in Robins, C.R., R.M. Bailey, C.E. Bond, J.R. Brooker, E.A. Lachner, R.N. Lea, and W.B. Scott. Common and scientific names of fishes from the United States and Canada, 5th edition. American Fisheries Society Special Publication 20. American Fisheries Society, Bethesda, MD. Courtenay, W.R., Jr. and C.R. Robins. 1989. Fish introductions: good management, mismanagement, or no management? CRC Critical Reviews in Aquatic Sciences 1(1):159-172. Courtenay, W.R., Jr., H.F. Sahlman, W.W. Miley II, and D.J. Herrema. 1974. Exotic fishes in fresh and brackish waters of Florida. Biological Conservation 6(4):292-302. Crutchfield, J.U., Jr., D.H. Schiller, D.D. Herlong, and M.A. Mallin. 1992. Establishment and impact of redbelly tilapia in a vegetated cooling reservoir. Journal of Aquatic Plant Management 30:28-35. Crutchfield, J.U., Jr. 1995. Establishment and expansion of redbelly tilapia and blue tilapia in power plant cooling reservoir. American Fisheries Society Symposium 15:452-461. Deacon, J.E. and J.E. Williams. 1984. Annotated list of the fishes of Nevada. Proceedings of the Biological Society of Washington 97(1):103-118. Eccles, D.H. 1992. FAO species identification sheets for fishery purposes: field guide to the freshwater fishes of Tanzania. Food and Agriculture Organization of the United Nations (FAO), Rome, Italy. Grabowski, S.J., S.D. Hiebert, and D.M. Lieberman. 1984. Potential for introduction of three species of nonnative fishes into central Arizona via the Central Arizona Project - A literature review and analysis. REC-ERC-84-7. US Dept of the Interior, Bureau of Reclamation, Denver, CO.
Hauser, W.J. 1975. An unusually fast growth rate for Tilapia zillii. California Department of Fish and Game 61(1):54-56. Hogg, R.G. 1976a. Ecology of fishes of the family Cichlidae introduced into the fresh waters of Dade County, Florida. Unpublished doctoral dissertation. University of Miami, Coral Gables, FL. Hogg, R.G. 1976b. Established exotic cichlid fishes in Dade County, Florida. Florida Scientist 39(2):97-103. Howells, R.G. 1991. Electrophoretic identification of feral and domestic tilapia in Texas. Texas Parks and Wildlife Department, Management Data Series 62. Austin, TX. Howells, R.G. 1992a. Annotated list of non-native fishes, mollusks, crustaceans, and aquatic plants, in Texas water. Texas Parks and Wildlife Management Data Series 78. Austin, TX. Howells, R. 1992b. Guide to identification of harmful and potentially harmful fishes, shellfishes, and aquatic plants prohibited in Texas. Texas Parks and Wildlife Department Special Publication. Austin, TX. Hubbs, C. 1982. Occurrence of exotic fishes in Texas waters. Texas Memorial Museum Pearce Sellards Series 36:1-19. Hubbs, C., R.J. Edwards, and G.P. Garrett. 1991. An annotated checklist of freshwater fishes of Texas, with keys to identification of species. The Texas Journal of Science, Suppl. 43(4):1-56. Idaho Fish and Game. 1990. Fisheries Management Plan 1991-1995. Appendix I - A list of Idaho fishes and their distribution by drainage. Idaho Departmen of Fish and Game. Khallaf, E.A., and A.A. Alne-na-ei. 1987. Feeding ecology of Oreochromis niloticus (Linnaeus) & Tilapia zillii (Gervais) in a Nile Canal. Hydrobiologia 146:57-62. Knaggs, E.H. 1977. Status of the genus Tilapia in California's estuarine and marine waters. Cal-Neva Wildlife Transactions 1977:60-67. Legner, E.F. and F.W. Pelsue. 1977. Adaptations of Tilapia to Culex and chironomid midge ecosystems in south California. Proceedings of the 45th Annual Conference of the California Mosquito & Vector Control Association 45:95-97. Maciolek, J.A. 1984. Exotic fishes in Hawaii and other islands of Oceania. 131-161 in W. R. Courtenay, Jr., and J. R. Stauffer, Jr., eds. Distribution, biology, and management of exotic fishes. The Johns Hopkins University Press, Baltimore, MD. McGowan, E.G. 1988. An illustrated guide to larval fishes from three North Carolina piedmont impoundments. Report by Carolina Power and Light Company, Shearon Harris Energy and Environmental Center, New Hill, NC. Minckley, W.L. 1973. Fishes of Arizona. Arizona Fish and Game Department Sims Printing Company, Inc, Phoenix, AZ. Morita, C.M. 1981. Freshwater fishing in Hawaii. Division of Aquatic Resources, Dept of Land and Natural Resources, Honolulu, HI. Moyle, P.B. 1976. Inland fishes of California. University of California Press Berkeley, CA. Pelzman, R.J. 1973. A review of the life history of Tilapia zilli with a reassessment of its desirability in California. Administrative Report 74-1. California Department of Fish and Game, Inland Fisheries Branch, Sacramento, CA. Schoenherr, A.A. 1979. Niche separation within a population of freshwater fishes in an irrigation drain near the Salton Sea, California. Bulletin of the Southern California Academy of Sciences 78:46-55. Schoenherr, A.A. 1985. Replacement of Cyprinodon macularius by Tilapia zillii in an irrigation drain near the Salton Sea. 65-66 in E.P. Pister, ed. Proceedings of the Desert Fishes Council Volumes XIII-XV-A (13th-15th Annual Symposia). University of Nevada, Las Vegas, NV. Siddiqui, A.Q. 1979. Reproductive biology of Tilapia zillii (Gervais) in Lake Naivasha, Kenya. Environmental Biology of Fishes 4(3):257-262. Smith-Vaniz, W.F. 1968. Freshwater fishes of Alabama. Auburn University Agricultural Experiment Station Auburn, AL. Stickney, R.R. 1986. Tilapia tolerance of saline waters: a review. The Progressive Fish-Culturist 48(3):161-167. Swift, C.C., T.R. Haglund, M. Ruiz, and R.N. Fisher. 1993. The status and distribution of the freshwater fishes of southern California. Bulletin of the Southern California Academy of Sciences 92(3):101-167. Taylor, J.N, D.B. Snyder, and W.R. Courtenay, Jr. 1986. Hydridization between two introduced, substrate-spawning tilapias (Pisces: Cichlidae) in Florida. Copeia 1986(4):903-909. Teugels, G.G., and D.F.E. Thys van den Audenaerde. 1991. Tilapia. 482-508 in Daget, J., J.-P. Gosse, G.G. Teugels, and D.F.E. Thys van den audenaerde, eds. Check-list of the freshwater fishes of Africa (CLOFFA). Volume 4. ISNB, Brussels; MRAC, Tervuren; and ORSTOM, Paris. Thys van den Audenaerde, D.F.E. 1964. Révision systématique des espèces congolaises du genre Tilapia (Pisces, Cichlidae). Annales Du Musée Royale de l'Afrique Centrale (série Zoologie) 124:1-155. Trewavas, E. 1982. Tilapias: taxonomy and speciation. 3-13 in R.S.V. Pullin and R.H. Lowe-McConnell, eds. The biology and culture of tilapias. ICLARM Conference Proceedings, International Center for Living Aquatic Resources Management, Manila, Philippines. Welcomme, R.L. 1988. International introductions of inland aquatic species. FAO Fisheries Technical Paper 294. Food and Agriculture Organization of the United Nations (FAO), Rome, Italy.